By now, I am certain that most of you have heard the terms “Search Engine Marketing”, “PPC” etc at least a dozen times. What do these terms actually mean? How does an investment in marketing a brand on a search engine like Google, Yahoo etc. translate into more revenue? How does one go about advertising on a search engine? Are there any dos and don’ts in creating a perfect campaign? Over the next few posts, I will try and cover some key concepts of Search Engine Marketing, namely the pay-per-click (PPC) model, that are imperative to create a successful search marketing campaign. Let’s start by understanding the basics. What is Search Engine Marketing (SEM)? Simply put, SEM is an Internet Marketing method that involves brand promotion through the purchase of ads. In this series, we will learn about Google’s Pay Per Click tool – Google Adwords. Google AdWords is an advertising platform that enables businesses to create ad campaigns (text, image etc.) on Google properties. The prevalence/position of your ads depends on the relevance of the keywords and match types you select. We will dive deeper into these concepts in our upcoming posts. For now, let’s start by understanding the benefits of marketing on search engines. We can all agree that every dollar spent on brand marketing is both important and accountable. A great deal of planning and strategy goes into developing a company’s digital advertising campaign. To successfully advertise on Google, one must first fully understand how it benefits a brand/business. Below, I have listed down a few of the many advantages of search engine marketing using Google Adwords. Targeted traffic to your website: One of the best things about being visible on search engines is that your website is available for business 24×7, which means you are open for traffic every hour of every day! In addition, Google Adwords allows you to drill down and set preferences to focus on customers that are most likely to give you business. Cost effective marketing: When you compare SEM to other advertising media, you will understand that the ROI is quicker and tends to be more on the positive side. One of the reasons why this is the case could link to our previously listed benefit – targeted traffic. The traffic driven to your site through SEM is more targeted, making it easier for you to convert prospects to customers. What’s more, there are absolutely no budget restrictions associated with ruining an SEM campaign using Google Adwords. This means that it is completely possible to get an SEM campaign up and running on a small budget, and if used effectively, small companies will easily compete alongside the market leaders. Brand Building: The reach of your brand is directly proportional to its visibility on search engines. 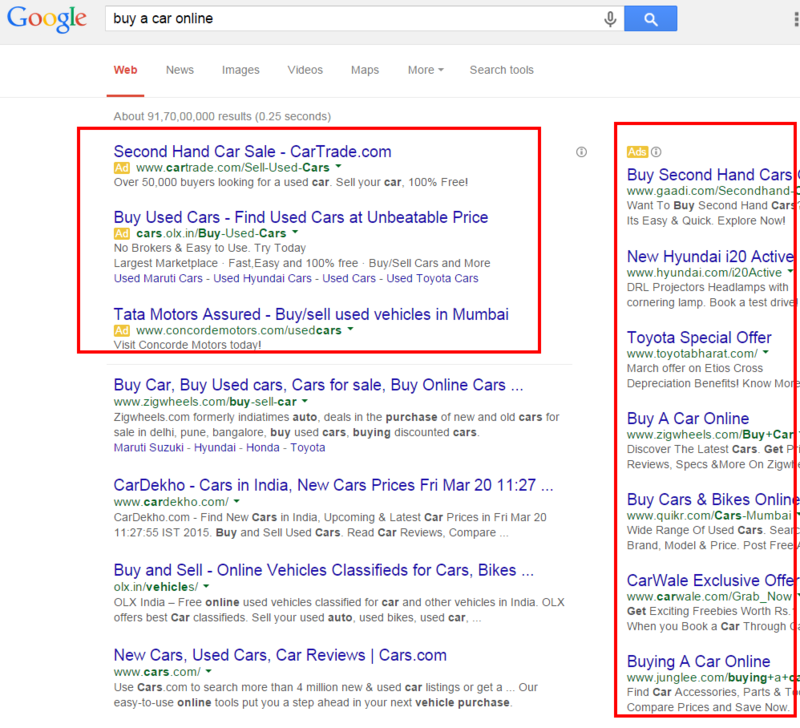 The more visible your brand is on search engines, the higher is the recall value of your brand. This recall value goes a long way in creating awareness, confidence and trust. Hassle–free Implementation: Once you have a digital marketing strategy in place, setting up a SEM advertising campaign is only a matter of few minutes. All it takes is for you to sign up on Google Adwords and fill up some basic campaign and payment related information. Once your PPC campaign is up and running, traffic will be attracted to your website within hours. Having said that, it is important to note that although the initial setup can be done in a short amount of time, it may take a few months for the campaign to have a significant effect on your conversions and revenue. Campaign measurability and flexibility: To analyze the performance of your campaign, Google Adwords is capable of providing you with useful data in the form of extensive reports that comprise of performance indicators, budget analysis, keyword research and a lot more. You can also change/adjust your campaign, based on these data metrics to enhance your campaign performance thus making it a very flexible form of advertising. Stay Competitive: A simple Google Search with some common keywords related to your business will show you that most of your competitors are already advertising on the likes of Google. You need search engine marketing to stay competitive in your industry. What are you waiting for? Get started with advertising on Google today! Having listed a few of the numerous benefits associated with marketing on search engines, the pressing question is not whether to advertise on the internet or not, but rather how to optimize marketing efforts to maximize ROI? In our upcoming blogs, we will cover the steps involved in creating a campaign, focusing on quality keywords, concepts such as ad rank, quality score etc. and discuss methods of maximizing ROI by covering several tips and tricks that go into creating an optimal search engine campaign. Leave a comment below and tell us what you think about this post.